With the increase of foreign outsourcing, more importers are discovering that their supply chains are becoming global. With this trend comes a very real need to minimize risks and loss by increasing and improving security measures of these vital supply chains. CUSTOM TRADE SOLUTIONS, a San Diego-based company, helps you minimize your risks and improve the movement of your imports. As supply chain security specialists, we help you apply for and maintain your C-TPAT certification - so you can safely and efficiently move products over the U.S.-Mexico and U.S.-Canada borders and at any the 325 ports of entry in the United States. Call CUSTOM TRADE SOLUTIONS today at (619) 944-0375, for support in gaining and keeping your C-TPAT certification. Why call CUSTOM TRADE SOLUTIONS? Qualify for an assigned Supply Chain Security Specialist (SCSS) from the U.S. Customs and Border Protection. Who can join the C-TPAT program? Call CUSTOM TRADE SOLUTIONS at (619) 944-0375 for more information on C-TPAT. The Custom-Trade Partnership Against Terrorism (C-TPAT) is a direct result of the September 11, 2001 terrorist attacks. 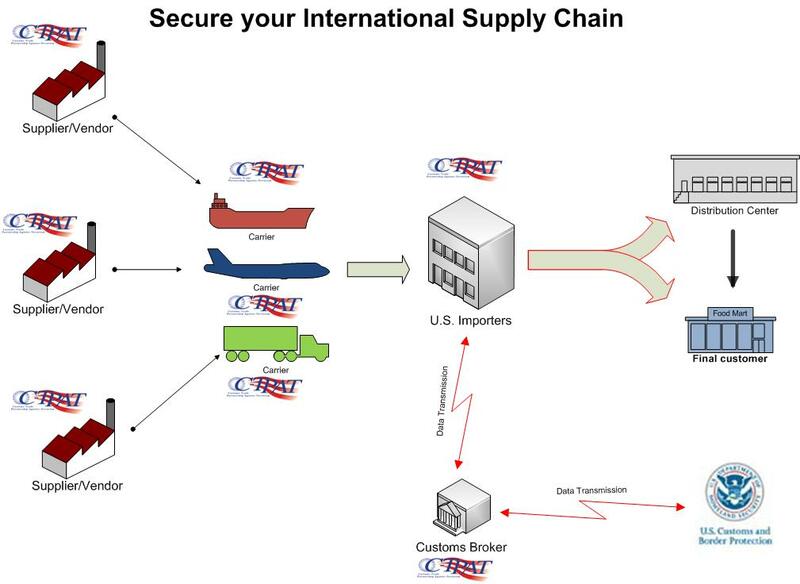 The U.S. government, with the assistance of the trade community, created this security program to ensure a more secure international supply chain. Certified members of C-TPAT, who can demonstrate thorough controls over their supply chain, will be granted substantial benefits by U.S. Customs and Border Protection. Copyright © 2012 Custom Trade Solutions. All Rights Reserved.